*If this is your first time renewing, there are NO CECs required. Continue with your membership payment ($85) and your new certificate and membership card will be mailed to you immediately. If you have renewed your certification one or more times already, then you are in year 2 or greater of your certification. In year 2 or greater, CECs are required. Read below for Continuing Education Credit details and how to submit for your credits. Starting in Certification Year 2, you must obtain 2.0 CECs to get recertified. 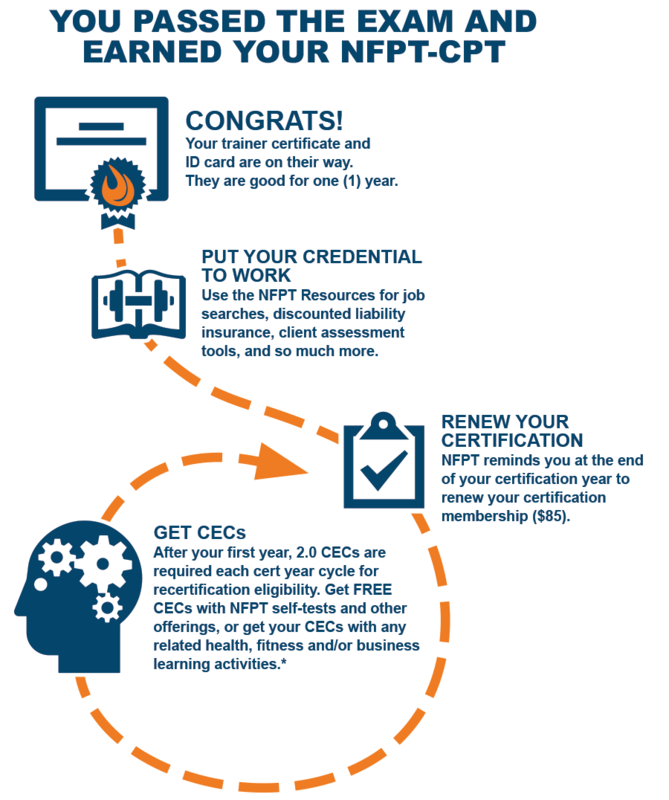 You can receive all CECs for FREE through NFPT offerings (such as NFPT Self-Tests, Fitness Flops, or the Trainer Refresher quiz). If you wish to pursue additional certificates, you can get CECs by completing NFPT CE Introductory or Advanced Courses, or you may submit any certificate of completion or other documentation which shows that you have completed a relevant learning activity. For FREE CEC options, and to submit all other forms of continuing education that you have completed, log in to your online account. We do not charge a review or petition fee for CECs. If you take the time to do something that educates you in exercise science or fitness business, we’ll give you the credit! the course/activity must be delivered and/or developed by a provider with relevant education and experience. This means that the individual developer or deliverer of the learning activity must be qualified to provide the respective instruction. NFPT will determine this case by case per submission based on the CE provider company and/or instructor of the course or activity that is delivered. Usually, when NFPT trainers submit non-NFPT forms of credit, we are familiar with the CE provider company that has delivered that learning activity and therefore do not have to research/review this recognition component. When submitting a learning activity that is not pre-approved by NFPT, we will ask that you answer a few questions to address these requirements and also include your certificate of completion or similar documentation. The submission form and instructions for additional documentation are in your NFPT online account. When submitting a learning activity that is pre-approved by NFPT, you will only need to submit the certificate of completion or similar documentation for your credit award. When completing a NFPT CE Course or FREE CE offers for CECs, you are automatically awarded credits, no submission is required. NEED TO SUBMIT DOCS for CECS? Log in to your NFPT Account and fill out the CE Activity Form for NFPT review and credit award approval. Answer a few questions and upload your certificate of completion or other documentation that confirms your participation in a relevant learning activity. By email. Simply email to [email protected]. Attach your certificate of completion or other documentation, we’ll let you know if we need additional information and/or how many CECs it’s worth. We’ll apply those CECs to your account immediately. If it’s easier, you can also take a picture of the docs with your phone and send it to us, we’ll take it! If you would like these forms in Hard Copy with all the details pertaining to Recertification, you can download the Recertification Packet. Consider the unique value that NFPT Certification provides when it comes to Continuing Education Credit requirements. All certification companies require CECs, but we make it easier on your schedule and easier on your wallet. Check out NFPT Certification options and choose the package that’s best for you.